Though I may have been born and raised in New Jersey, my family originated in Long Island (pronounced with a hard “G”). Whether it be for work, or visiting relatives, or both, I find myself up that way quite a bit. So, it was just a matter of time before I found myself on one of these trips and craving some wings. On my way home I took a detour into a little bar called Rookies in Huntington, NY which is a sports club that was very clean and modern with a ton of TVs and friendly people. As soon as I sat down, I was greeted with a free shot offer to try some new vodka (which normally I would be all over, but not with a 3hr drive ahead of me). Vodka or beer, friendly service or not, I was here for only one thing… The wings (oh, and some fries). From a menu ranging from six wings to 100 and offering about ten sauces, I made my selection. I went with the classic Buffalo sauce with some Hell Fire on the side and ordered up a dozen because I felt that six wouldn’t be enough to fill me…. boy was I wrong. The wings came out in a huge pile of jumbo-ness; I mean these things were gigantic!! So much so that each wing was about double the size of what I would normally expect at a similar place. They came accompanied with a side of blue cheese as well as a mix of celery and carrots. Now, I’ve seen places out west that use only carrots and around the east coast we typically find celery, but I love when places have the combination of both because I think that carrots offer a bit more bite while celery adds a more soothing watery sensation. I’m just saying, they’re a good team. I started in on the wings, and what I noticed half way in was that even though these things were big, the meat didn’t overpower the sauce. What I mean is: usually when you have large wings, there is so much meat, that you lose the tastiness of the wing sauce because of the meat to skin ratio. You get a bite of the skin and then are left chewing on the meat forever. This is not the case here, however. Each wing was breaded and had the sauce coated on them so well that no matter how big a bite was, I still got a constant Buffalo flavor throughout. My only complaint would be that the meat itself needed a bit more flavor on its own as it was pretty standard, not bad… just normal. And when you’re on a quest looking for the extraordinary – the kind where the meat falls off the bone with an awesome slow cooked taste in every bite – normal just doesn’t cut it. When there is no substantial taste to the chicken, a restaurant usually relies heavily on the sauce to bring the flavor, and man did they have something great to fall back on. The sauce had the great Buffalo style that we all know and love, but also had an extra kick that left my lips tingling after each wing. It wasn’t overbearing by any stretch and was definitely my speed when it came to heat… hot and tasty. But if you live your lifestyle by the expression “Go bold or go home,” then Rookies has a sauce for you. Normally, I am fooled with names like “Inferno” or “Devil’s Door Fiery Pit of Hell Hot Gate from Sun Sweaty Death…” (well you get the idea) I am usually disappointed because the heat does not live up to the name. That all got put to rest when I tried the side of Hell Fire from Rookies. Not only did I see the little bits of Habañero in the sauce, but it stuck right to the wing without remorse, as if it were saying “oh hell no, you are gunna eat everything I have to offer… no dripping here… man up and take a bite!” So, man up I did. …well at least for one bite anyway. And that one bite took me right back to when I ate the Habañero during the Pepper Tasting. This stuff was WAY too hot for my liking, but you hot heads would’ve loved it as it brought massive heat without choking me up. There is always room for improvement, but Rookies Sports Club doesn’t need to go too far as this was a great place with near perfect wings. The wings are incredibly large, so order carefully or you’ll find yourself filled up real fast and resort to taking the rest home in a box (which is never a bad thing as it allows you to enjoy them all over again). 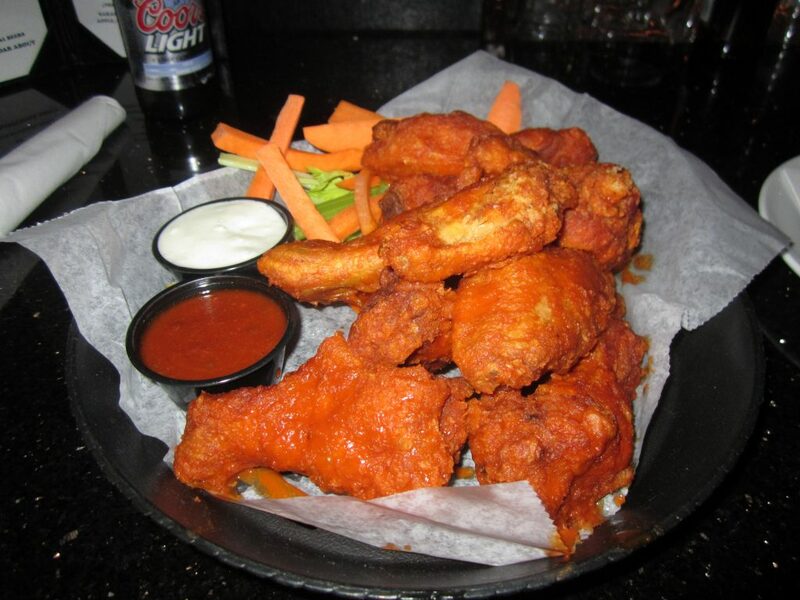 So, if you find yourself in the Huntington area and looking for a great place for wings, I suggest you stop in and see the guys at Rookies for it will leave you with a happy belly and even happier tongue.